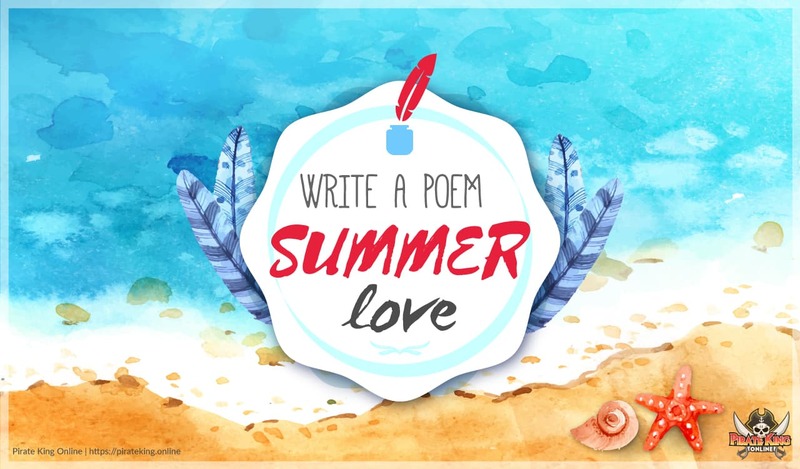 Writers must write an original poem about PKO embedding topic of "summer love"
Poem must be at least 20 words, preferably no more than 150. Poem must be in English. It is allowed to have styling of words. Poem that was published before does not qualify. One selection of weapon apparel, this weapon apparel is a unique clone and has permanent visual effect bonded to itself, exhibiting visual glows. Additionally, a prorated amount of rum barrels will be assigned depending on what place won between first and third place. More information about this to be detailed later. the poem should be redacted in english? what about other languages? how we wonder why PKO is fun? PKO, PKO, play all the night. If Oss did not twinkle so. 'Join PKO and make it your goal". @Olpers save ur poem for when the event begins. When u gonna detail rewards like apparels, etc? even toilet can't hold my wetness. Good night my friend, your head’s in big trouble! I hear the whisper of the wind, it brings a song with it. Deep inside my heart I get the feel, the memory within myself of you. The smell of the sand and the sea is the meaning of my plea. I pray to sail in the waves of your being and sink in the shores of your lips. To finally find my resting place following the guidance of the wind. The sea is my life and points the path to find you again. My dear goodness the mermaid of the sea, sing for me once again. Those lyrics that made my heart calm, those feelings that paint a smile in my face. My beloved one , my missing treasure. My heart beats following the clues to our encounter. In this great land I found myself lost, feeling down for not having you in my arms. So I wander around the shores following your singing. Praying to the sea to have you once again. And finally rest in the deeps of the great blue, having my final breath with a kiss of eternal love. Oh my dear , oh my love, make feel alive again once more. People call me the wanderer of the sea, since I always keep looking in the bright and blue horizon, day after day, night after night, searching for you my mermaid of the great sea. From the sheep skin he put hope. Only Goddess Kara can tell. Why such effort you ask? I a voyaguer in love. the traces of our steps. of the honeys of your lips. and cold is the breeze. Now I hear it clearly, "My dear Lance"